But nobody probably doubts that the quality of an artistic research is largely dependent on the individual desire of the researcher, on the spark of necessity that turn mere research data into a work of genuine reflection. In an invitation that has the power to instigate interest and a dialogue that extends beyond the safe limits of the research environment. 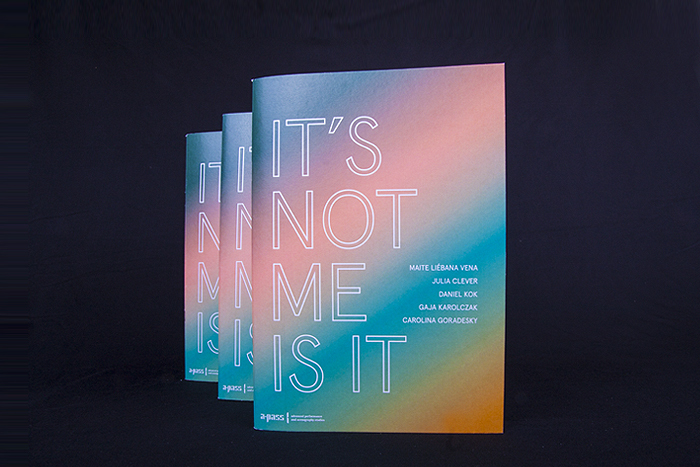 In this booklet we look into the work of five artist researchers: Daniel Kok, Gaja Karolczak, Julia Clever, Carolina Goradesky and Maité Liébana Vena. In their (very diverse) cases, each of them explores a possible strategy to deal with the ‘I’ of the researcher: as a ‘problem’ to address the needs of the European community and rethink the public as a simultaneous singular and plural body (Daniel Kok). As a constantly shape-shifting ground for the experience of the phantom body (Gaja Karolczak). As a foreigner in search for spatial re-cognition (Carolina Goradesky). As a performer healing the self through dialoguing with a plant, inviting the spectator to share in the experience (Maité Liébana Vena). Or as a discrete witness to the playing out of History in WWII reenactments (Julia Clever). All of them put their bodies and self-constructions at risk, expose themselves as historically, geographically, racially or otherwise bent relational territories on which the larger narratives of aesthetics and politics cross and intertwine. Their stories in all their small-scale intensity are mirroring fragments of larger forces that can not so easily be grasped or experienced: the violent manipulations of commerce, migration, politics and global economics. But especially also the artificial – because always mediated, manipulated and accidental – coming-into-being of the self.